Fuji: an architecture that says "kids first"
"Is this all ours? ", asked a junior pupil. 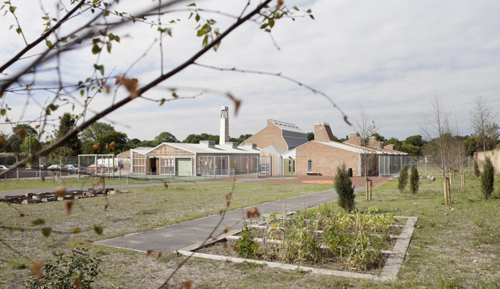 "The children are excited by all the space they now have", says Julia Simpson, the charismatic head teacher at Sandal Magna School, who has championed the project replacing the old dilapidated red brick Victorian primary school (Bauman, 2010: 39). 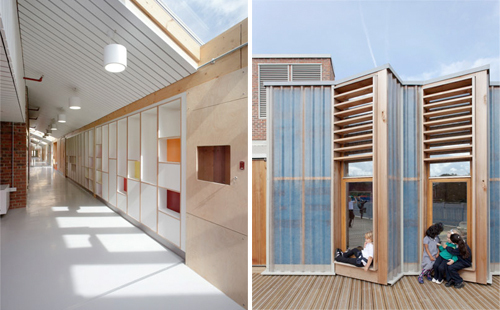 The new design by Sarah Wigglesworth Architects serves the Wakefield, England community - including the 210 pupils who attend the primary school, the 26 younger children who attend the attached nursery, and a community room for community activities or events. The architects' renderings of the school design concept, which combines natural materials, plenty of 'greenery' and gardens of flowers and vegetables - providing it's pupils with a relaxing and healthy environment, teaching them good practices for healthy living. The brief was to design a highly functional, efficient, aesthetically pleasing and durable building. Extensive discussions with the community and teachers established additional design priorities such as a sense of history, a new identity, the provision of a variety of play spaces and the consideration for the building to 'fit in' with its urban context. 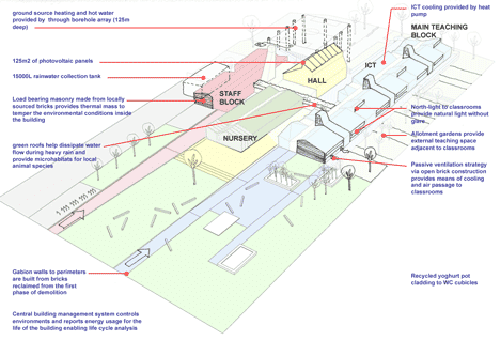 This axonometeric drawing show the various parts of the school - the main teaching areas, hall, nursery, staff black and outdoor play spaces. Here you can also see the various forms that have been utilised for each, giving them a specific character and identity. The design responded to these aspirations with a building that sits low on the site and is oriented to receive maximum natural ventilation and daylight. The spatial plan utilises three linear 'fingers' featuring double-loaded corridors, enabling much light and air to flood each of the separate buildings, and enabling a constant visual link to the outdoors, whilst also allowing for the possibility of future expansion. 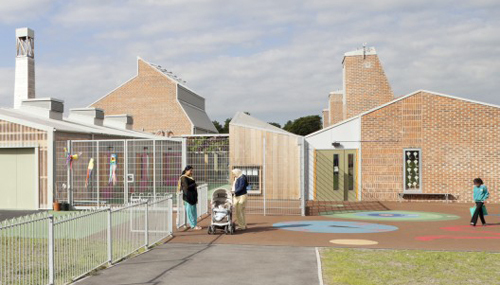 Materials used include reclaimed red brick from the existing Victorian school, solid timber, weatherboard, sheet cladding and corrugated rain screens. Exposed services are also included in the design vocabulary. There are numerous types and sizes of windows used throughout the building according to their orientation and internal use, their cills kept low to accommodate the young users. The forms employ a range of sharp angular geometries, which combined with the material palette, denotes different uses and provides a range of spatial experiences for the young children. A touch of delight, is the new bell tower, which was constructed to replace the original, a powerful landmark for the school that continues its 120-year-old tradition of ringing the bell at the start and finish of each day. Therefore maintaining a sense of history, and of Wakefield's industrial heritage for the school. Environmental features include the brick thermal mass, natural ventilation and provision which ensures that carbon dioxide concentration does not exceed 1,500ppm during the day (the school is one of the most carbon efficient schools in the UK); electronic dampers control fresh air entering the building through the vents; a ground-source heat pump, which is controlled by a 100 metre squared photovoltaics are situated on the south-facing school hall; a rainwater catchment system; and alloted gardens which will be used for educational purposes. 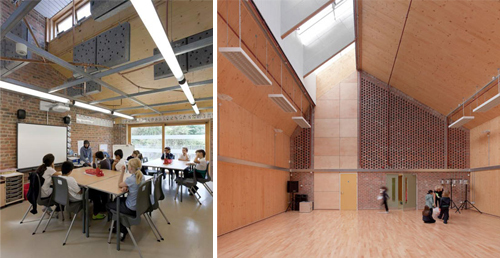 Contextually, the school takes its cue from its vernacular surroundings, referencing the pattern of its surrounding terraced houses and back streets. 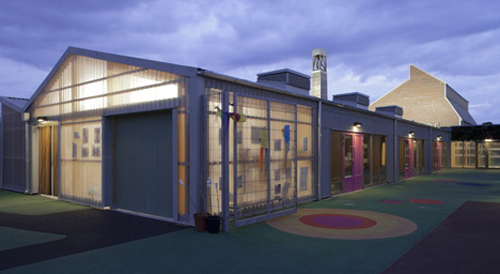 The use of a number of materials, window types, varying roof forms and exposed services creates a playful and delightful architecture for the young children. 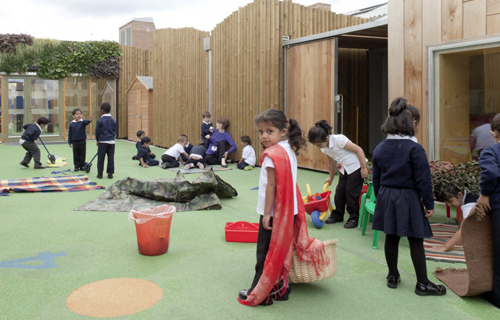 Providing them with a range of spatial experiences and opportunities to spark their imaginations. The use of serious and sensitively chosen colours and natural materials not only takes the young children seriously, but provides the children with a healthy and homely environment that they may be proud to call their own. 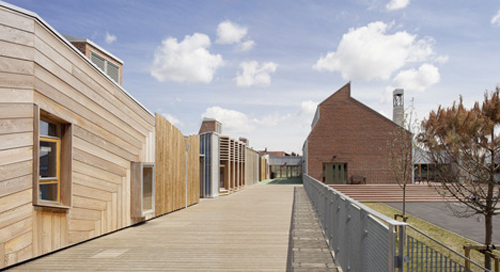 I like this comment from a reader of Dezeen: "Sandal Magna School is monumental in its own way: For the way it challenges the establishment on how schools can be designed well on a tight budget; for the way that it proves architecture matters without being superficial and slick; for striving to make a difference." Via Architecture Today, ArchDaily, The Architects Journal, and Dezeen.